Actually, no, that’s not how karma works. Karma is not an eye for an eye. By this point, everyone and their dog has heard of karma and some of us even venture to think we know what it means. Karma is, like the universe, like life, more complex and grand than our human minds can ever comprehend. Karma, in Buddhist terms, is defined as the impact of your past imprinting on your present and your future. That doesn’t mean if I steal your bike, my bike will be stolen. Maybe it will and maybe it won’t. 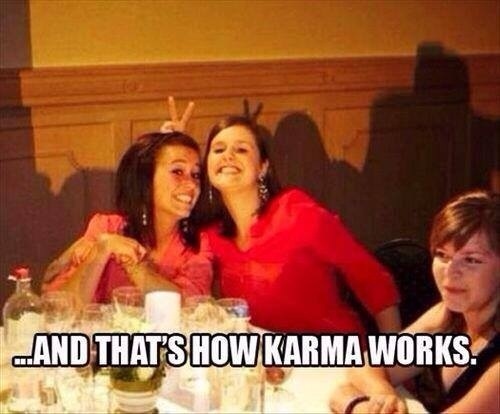 It certainly doesn’t mean that “instant karma” is having shadow bunny ears appear behind your head because you are slyly giving someone bunny ears in a photograph. Karma. The impact of your past imprinting on your present and future. Karma. It pays to be kind. Karma. Why we try our best. Accumulating good karma is always recommended. But, especially in the context of reincarnation, we are unaware of the karma—“good” and “bad,” though of course it’s infinitely more intricate than those two gross categories—that we’ve accumulated over many lifetimes. So, let’s stop perpetuating an oversimplified, false and bastardized notion of the Law of Karma. The truth is trillions of trillions of parallel realities co-exist right now based on every choice that could have been and actually was made differently by very single soul in those other realities since the beginning of time, the beginning of choice, and based on every choice that can be and actually will be made in the future by every single soul until the end of choice, until infinity. These realities exist separately, spiraling around each other in a fractal, spiral formation, and they also converge and weave in and out of one another at different points in people’s individual lives and at different points in history, in our collective lives, giving us the opportunity to get off our current path, change our current trajectory, and move into another reality, connect with a different line of causation. Read more on how to clear our individual karma by my spiritual friend, author Edward Mannix. Previous Previous post: Death and the End of Luck. Next Next post: Living in the Present Moment… and Having a 5 Year Plan. Wow! That is the clearest description of karma I have ever read! It’s not linear at all! And we may as well just throw back our heads and laugh, for what a ride it is! It’s all physics!